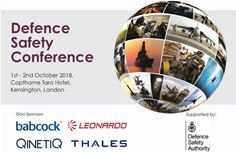 Sir Simon Bollom, newly appointed Chief Executive for Defence Equipment and Support (DE&S) will deliver a briefing at The Defence Safety Conference, on the 1st and 2nd October 2018 in London. Organised by SMi group and supported by the Defence Safety Authority, UK Ministry of Defence, the Defence Safety Conference will address the broad spectrum of safety across Military Aviation, Land and Maritime. SMi anticipate the event will bring together more than 200 senior attendees from the UK Armed Forces, its international allies and industry. Sponsored by Gold Sponsors: Babcock, Leonardo, QinetiQ and Thales, and exhibited by Burgess Consulting and BMT, there are limited opportunities for industry to contribute to the conference.